Senate Democrats on Thursday unveiled the Ex-Patriot Act (Expatriation Prevention by Abolishing Tax-Related Incentives for Offshore Tenancy,) a bill to punish Americans who renounce their citizenship for tax purposes. The move was a reaction specifically to Facebook co-founder Eduardo Saverin, who last fall withdrew his citizenship in advance of the company's multibillion-dollar initial public offering, set to take place Friday. Saverin could save $67 million in tax costs after the Facebook IPO deal by dissociating himself from the United States, and the bill's sponsors say they want to ensure that money ends up in the U.S. Treasury. Democratic Sens. 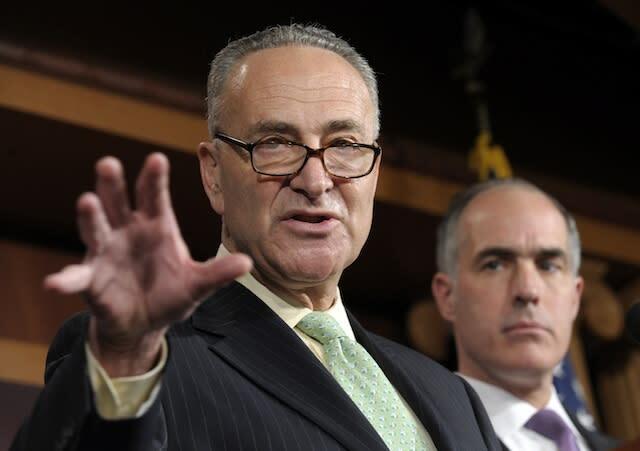 Bob Casey of Pennsylvania and Charles Schumer of New York outlined the bill Thursday. It would impose a 30 percent capital gains tax on investments within the country on anyone who renounces citizenship to avoid taxes. The bill would also ban Saverin—and others who take similar action—from ever setting foot on American soil again. "Eduardo Saverin wants to de-friend the United States of America," Schumer said. "Sen. Casey and I have a status update for him: Pay your taxes in full or don't ever try to visit the U.S. again." Saverin currently lives in Singapore, which has no capital gains tax. Schumer estimated the bill would apply to about 3,000 people. "This is a small, narrow group," he said. "And they deserve to get the treatment we're giving them." In a statement released later Thursday afternoon, Saverin said he intends to pay taxes on all of the money he earned as a U.S. citizen. "My decision to expatriate was based solely on my interest in working and living in Singapore, where I have been since 2009. I am obligated to and will pay hundreds of millions of dollars in taxes to the United States government. I have paid and will continue to pay any taxes due on everything I earned while a U.S. citizen," Saverin said. "It is unfortunate that my personal choice has led to a public debate, based not on the facts, but entirely on speculation and misinformation."